I use it with Linux Mint on my old laptop and Raspbian on my Raspberry Pi. The Raspberry Pi model B is a 35 dollar computer that’s about the size of a deck of cards. I believe it is made possible by the proliferation of low-cost components developed for mobile devices like smartphones, which are now adequate to power a modest general-purpose computer. More background and technical details are discussed on Wikipedia. 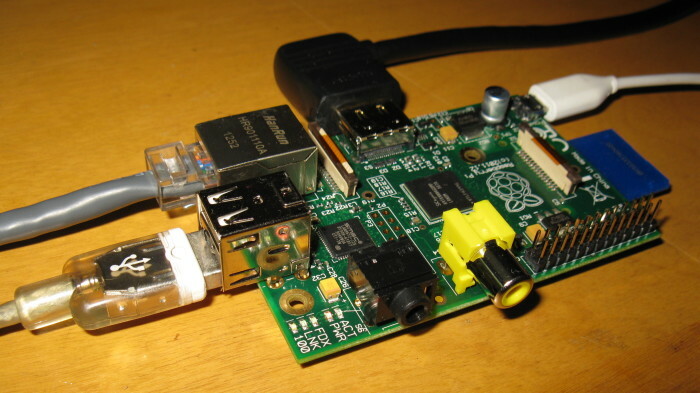 It’s a bare-bones system consisting of a circuit board ringed with connectors: 2×USB, ethernet, HDMI/RCA video, 3.5mm audio, 5-volt power via micro USB, and an SD card slot. 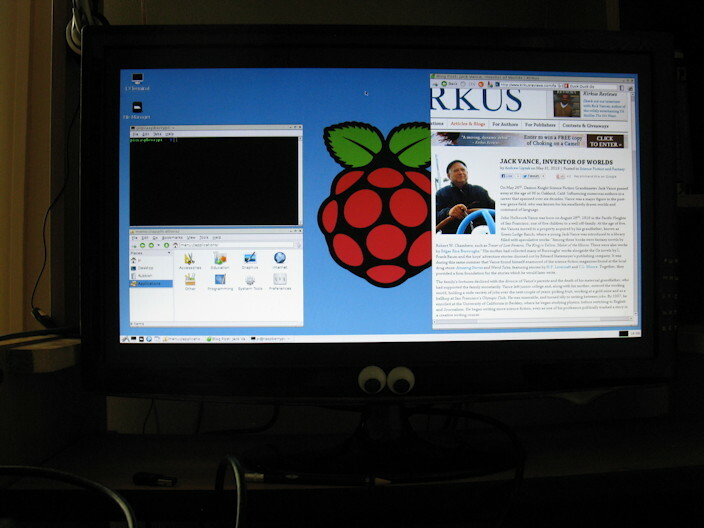 There’s no hard drive; it boots from the SD card, on which I’ve installed Raspbian, a pared-down Linux distribution tailored to the Raspberry Pi. The 5v power supply is common to many cell phones and other small devices. I’m using an iPhone charger. Eventually I’d like to build a custom case. So far, I’ve just been experimenting with what doodads work with the Pi. It has no built-in wireless networking capabilities, but I was pleasantly surprised to find it readily recognized the little Airlink USB wifi adapter I picked up some time ago (but ultimately did not need) for my laptop. Some tinkering is required to get certain features to work, but the fun of figuring things out is arguably half the point of a device like this. It isn’t very fast, either, but hey, man, it’s only $35! 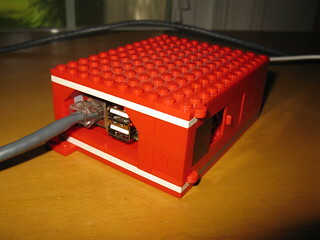 I haven’t assigned a particular task to my Raspberry Pi yet. Due to its low power consumption and perfectly quiet operation, it seems well-suited to take over from my Mac as a server for my ebook catalog, my growing army of eccentric Twitter bots, or other programming projects. 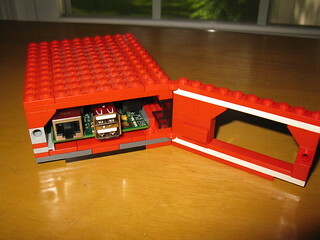 Alternatively, it could be the built-in brain for the book scanner I’m rebuilding. Or it could control a battery-powered 3D helmet-cam!